Your child’s Bar/Bat Mitzvah is a once-in-a-lifetime event, so be sure to celebrate it in a way they’ll never forget - at Dave & Buster’s. We oﬀer customized and kosher menus, private event space that can accomommodate groups of 10-1200, an in-house DJ, and hundreds of interactive and video games in our Million Dollar Midway. A big day requires a big celebration! COME AS A GUEST. LEAVE AS A LEGEND. Plan an event at the only venue where culinary chops, craft beverages and epic gaming all come together for one unforgettable event. Whether youâ&#x20AC;&#x2122;re putting in some corporate bonding time or just looking for pre-planned, super-awesome, mind-blowing events, weâ&#x20AC;&#x2122;ve got you covered. your gatherings memorable and complete. Advertise in Plan It! 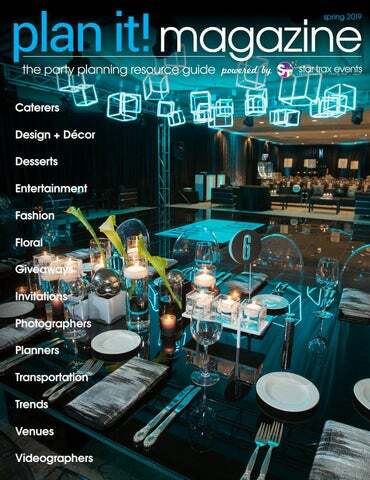 Magazine The need for year-round event planning assistance has inspired Plan It! Magazine. 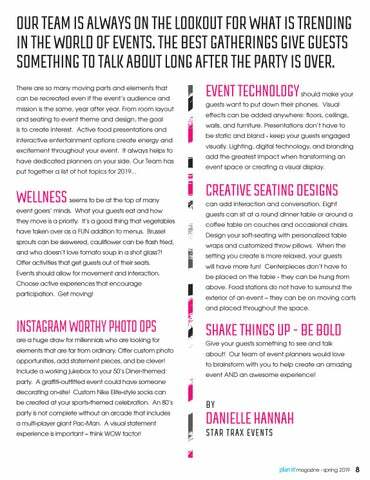 This party planning guide is filled with trusted referrals and local businesses providing resources and services for planning lifecycle and corporate events. mobile party solutions e often come across “the perfect venue” for an event … only to later find out that the site lacks kitchen space and sufficient resources needed for catering. While we are always able to find warmers, utility racks, and other basic catering essentials, we could never find a fully-equipped, rentable kitchen. Until we met Kristin Brochert, owner of Trailer Events. Trailer Events has made it possible for us to bypass what could have been a major event restriction or venue deal breaker and turn the space into a state-of-the-art facility. Originally in the restoration business, Kristin offered a solution for anyone planning a renovation project or an emergency situation that required immediate restoration: a mobile kitchen. Her clients were mostly schools, summer camps, and nursing homes. Word got around about these mobile units and it soon became obvious that the private events world could also utilize her brilliant idea of a mobile kitchen. Thus, Trailer Events was born. We had our solution to hosting events in fantastic venues with little or no kitchen space! Trailer Events offers a state-of-the-art commercial grade, NSF Approved, and fully licensed mobile kitchen. The kitchen has a functional floor plan design and includes the necessary equipment to prepare and serve food in a clean, safe, mobile environment. As Kristin’s business grew, clients began asking for a specialty trailer for tailgating. State-of-the-art and equipped with a stainless-steel refrigerator, microwave, outside gas grill, generator, and private restroom, these specialty trailers offer a convenient mobile party solution. The trailers are hi-tech with an HDTV monitor, remote, satellite, and Bluetooth capabilities. In response to increased demand for mobile units, Kristin has added executive restroom trailers to her arsenal. We were fascinated by the beauty and functionality of these units. With separate entrances for men and women, the restrooms have private stalls, stainless trim mirrored vanities, hand sinks with warm water, LED lighting, and ventilation complete with heating and cooling systems in place. You never know when you’ll be hosting an event in need of additional restrooms. Kristin and her knowledgeable staff have taken the stumbling blocks out of hosting events. Their mobile kitchens, specialty trailers, and executive restroom trailers can be used for any event, whether it’s a sophisticated corporate gathering, private occasion, tailgate party, or backyard BBQ. Trailer Events is fun to work with and passionate about perfection and customer satisfaction. They have you covered from A to Z and will certainly impress you with their capabilities at your next event! event goers’ minds. What your guests eat and how they move is a priority. It’s a good thing that vegetables have taken over as a FUN addition to menus. Brussel sprouts can be skewered, cauliflower can be flash fried, and who doesn’t love tomato soup in a shot glass?! Offer activities that get guests out of their seats. Events should allow for movement and interaction. Choose active experiences that encourage participation. Get moving! guests want to put down their phones. Visual effects can be added anywhere: floors, ceilings, walls, and furniture. Presentations don’t have to be static and bland - keep your guests engaged visually. Lighting, digital technology, and branding add the greatest impact when transforming an event space or creating a visual display. CREATIVE SEATING DESIGNS can add interaction and conversation. Eight guests can sit at a round dinner table or around a coffee table on couches and occasional chairs. Design your soft-seating with personalized table wraps and customized throw pillows. When the setting you create is more relaxed, your guests will have more fun! Centerpieces don’t have to be placed on the table - they can be hung from above. Food stations do not have to surround the exterior of an event – they can be on moving carts and placed throughout the space. 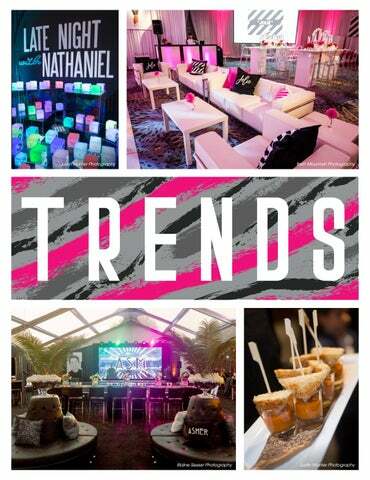 SHAKE THINGS UP - BE BOLD Give your guests something to see and talk about! Our team of event planners would love to brainstorm with you to help create an amazing event AND an awesome experience! decorating on-site! Custom Nike Elite-style socks can be created at your sports-themed celebration. An 80’s party is not complete without an arcade that includes a multi-player giant Pac-Man. A visual statement experience is important – think WOW factor! Months and months of planning every detail. Millions of emails. Lots of calls. Spreadsheet after spreadsheet. One Pinterest page and then another. The event is finally here – all of your hard work is in front of your eyes. In a blink, it's over. You celebrate the moment as long as you can – and then – your pictures arrive! Our events live on forever through the images taken by creative photographers. Hiring a photographer will be one of your best investments. With a phone, anyone can take pictures. But a schooled photographer knows where to be and when to be there, and will always capture the smallest details that otherwise would have been missed. Choose wisely. Here are some of our favorites. Erik Roush / roushphotography.com / 248.496.9401 / erikroushphoto@gmail.com Photography is my life. Anyone can point and shoot – I am always looking for the priceless moments that your family will treasure forever. I want you to look back on the images and not just see the event but feel it as well. The best part is that you get to enjoy yourself and I get to capture every little detail. 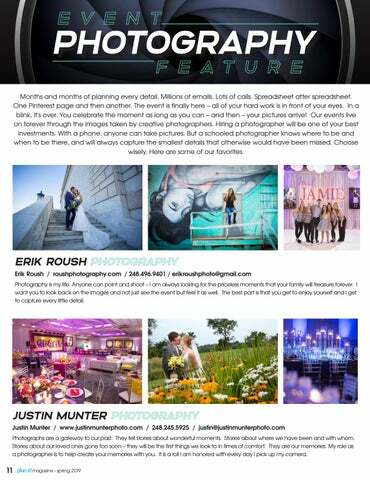 Justin Munter / www.justinmunterphoto.com / 248.245.5925 / justin@justinmunterphoto.com Photographs are a gateway to our past. They tell stories about wonderful moments. Stories about where we have been and with whom. Stories about our loved ones gone too soon – they will be the first things we look to in times of comfort. They are our memories. My role as a photographer is to help create your memories with you. It is a roll I am honored with every day I pick up my camera. 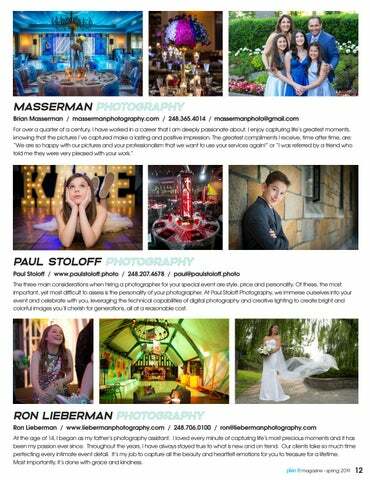 Paul Stoloff / www.paulstoloff.photo / 248.207.4678 / paul@paulstoloff.photo The three main considerations when hiring a photographer for your special event are style, price and personality. Of these, the most important, yet most difficult to assess is the personality of your photographer. At Paul Stoloff Photography, we immerse ourselves into your event and celebrate with you, leveraging the technical capabilities of digital photography and creative lighting to create bright and colorful images you’ll cherish for generations, all at a reasonable cost. Ron Lieberman / www.liebermanphotography.com / 248.706.0100 / ron@liebermanphotography.com At the age of 14, I began as my father’s photography assistant. I loved every minute of capturing life’s most precious moments and it has been my passion ever since. Throughout the years, I have always stayed true to what is new and on trend. Our clients take so much time perfecting every intimate event detail. It’s my job to capture all the beauty and heartfelt emotions for you to treasure for a lifetime. Most importantly, it’s done with grace and kindness. BAR/BAT MITZVAH PARTIES THAT ROCK! UNIQUE EVENT SPACE FOR PARTIES OF ALL SIZES! On one of the busiest nights in the D – the 2019 Detroit Auto Show– and with many competing charity preview events, it is always a challenge to create new engaging environments to attract attendees. 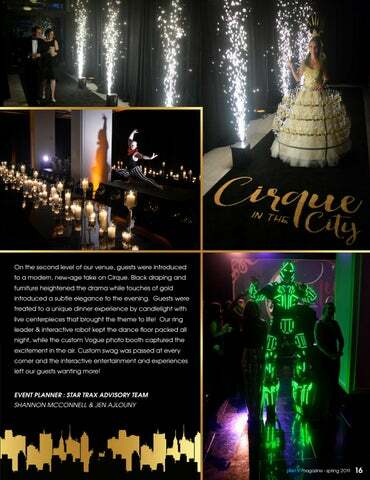 Setting the tone from the very beginning of the event, we transported guests into another realm – Cirque in the City. Greeted at valet with a Flame Show, 300 attendees were led through a VIP tunnel of sparklers directly to a beautiful model in a Champagne Skirt, before arriving at registration. What is new, fresh and trendy? By attending the Special Event & Catersource shows and The Knot and Wedding Wire webinars, we stay on top of what's in style. Our clients are choosing less fussy, more organic, natural earth-friendly linens. Matte textures are in, shiny sequins are out. What are your prices? Every event is unique. We try to create an option that will work with the clients' budget. Alpha Amusements / Chris Pascaretti How much power do we need to run our games? Each game is the equivalent to running a small computer. We recommend having 3-5 amps available per game, however, we will work with the venues closely to make sure there are no power issues. Dapper Dan Magical Entertainment Dan Sperling When is the best time to offer strolling magic during an event? Strolling magic entertainment works best during cocktails and appetizers. It can be done during dinner, but this is often disruptive to the guests trying to enjoy their meal. Detroit Marriott Troy / Kristin Norris Are you willing to customize a menu? Our Culinary Team would be delighted to customize a menu to fit your wants and needs - from special dietary requests to cultural specialties. Our food and service is absolutely impeccable. DSO / Max M. & Marjorie S. Fisher Music Center Stephanie McClung How old is Orchestra Hall? We are so excited to say that 2019 is Orchestra Hall’s Centennial! We think she looks pretty good for 100 years, and we are thrilled to have specialty programming for this celebration! Garden Theater / Amy Ancevski Do we have to use in-house catering or are we able to bring in our own caterer? You have the option to utilize our in-house catering company or choose from a list of our preferred catering vendors. There is no fee to bring in one of our preferred catering vendors. SHE Clothing Company / Sharon Eisenshtadt What makes being styled at SHE unique? Clients shop SHE when they’re looking to achieve a personal sense of style that radiates personal confidence. We believe that you can only find this unique level of personal attention in our boutique environment. Star Trax Events / Shannon McConnell How many dancers should I add to my party? Dancers increase the interaction and energy level on the dance floor, keeping your guests involved in the fun. 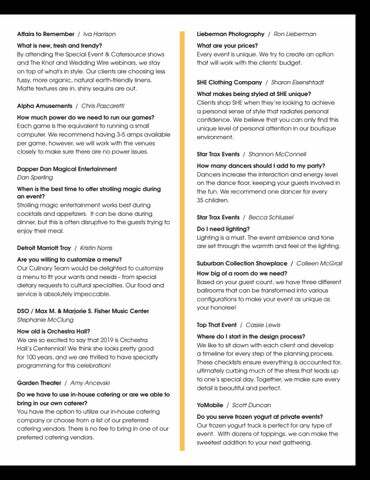 We recommend one dancer for every 35 children. Star Trax Events / Becca Schlussel Do I need lighting? Lighting is a must. The event ambience and tone are set through the warmth and feel of the lighting. Suburban Collection Showplace / Colleen McGrail How big of a room do we need? Based on your guest count, we have three different ballrooms that can be transformed into various configurations to make your event as unique as your honoree! Top That Event / Cassie Lewis Where do I start in the design process? We like to sit down with each client and develop a timeline for every step of the planning process. These checklists ensure everything is accounted for, ultimately curbing much of the stress that leads up to one’s special day. Together, we make sure every detail is beautiful and perfect. YoMobile / Scott Duncan Do you serve frozen yogurt at private events? Our frozen yogurt truck is perfect for any type of event. With dozens of toppings, we can make the sweetest addition to your next gathering. I received a lead crystal heart shaped box that the bride put Hershey’s Kisses in for her female guests. I utilize that box to this day and think of the bride every time I see it. 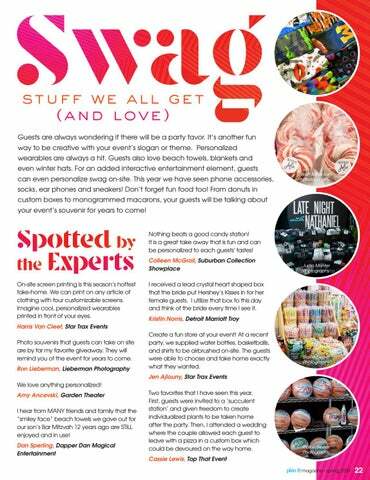 Kristin Norris, Detroit Marriott Troy Create a fun store at your event! At a recent party, we supplied water bottles, basketballs, and shirts to be airbrushed on-site. The guests were able to choose and take home exactly what they wanted. engaged. If itâ&#x20AC;&#x2122;s not on our list, challenge us to find it for you. Fully staffed and managed, we are always ready to go! • A small book with a series of pictures. BRING YO U R V ISI O N TO LIFE. At Detroit Marriott Troy, we specialize in cultivating memorable Jewish events. Gather your family and friends for an unforgettable wedding, bar mitzvah or bat mitzvah celebration. Our close to 20,000 square feet of dynamic event space is perfect to inspire up to 700 guests, and our talented culinary team is eager to serve up inspiring menus that honor your traditions and satisfy your tastes. Everything you need is right here in Troy, with newly renovated guest rooms ready to greet you this June. START PLANNING YOUR EVENT TODAY. CONTACT OUR MEETING EXPERTS AT 248.680.9601 OR VISIT TROYMARRIOTT.COM. D E T R O I T M A R R I OT T ® T R OY 200 West Big Beaver Road, Troy, MI 48084 248.680.9797 TroyMarriott.com © 2019 Marriott International, Inc. Guests are always wondering if there will be a party favor. It’s another fun way to be creative with your event’s slogan or theme. 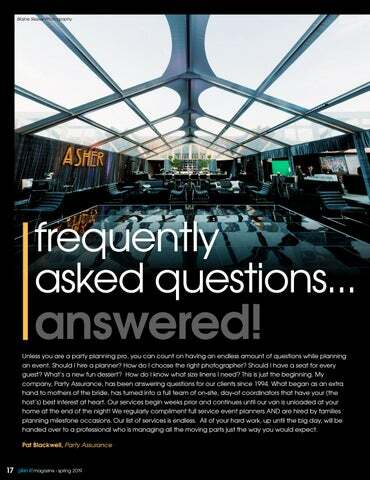 Unless you are a party planning pro, you can count on having an endless amount of questions while planning an event. Should I hire a planner? How do I choose the right photographer? Should I have a seat for every guest? What’s a new fun dessert? How do I know what size linens I need? This is just the beginning. 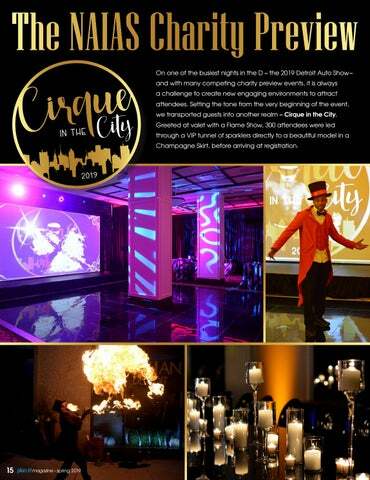 Setting the tone from the very beginning of the event, we transported guests into another realm – Cirque in the City. Hiring a photographer will be one of your best investments. A schooled photographer knows where to be and when to be there, and will always capture the smallest details that otherwise would have been missed. Here are some of our favorites. 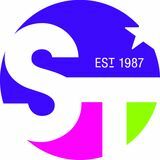 Our team is always on the lookout for what is trending in the world of events. The best gatherings give guests something to talk about long after the party is over.